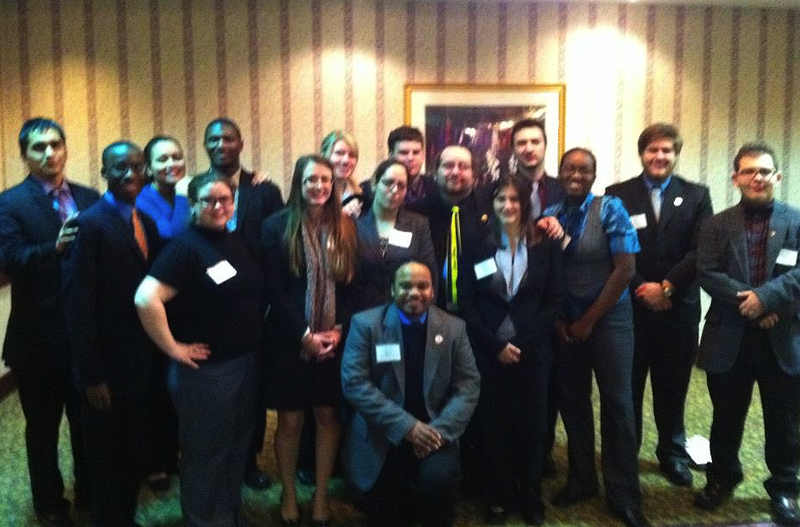 The Triton College Delegation earned third place in the 34th annual Model Illinois Government (MIG) simulation on March 4, 2012. The team went to Springfield with a game plan to become the most dominant school at the event. Four members ran for positions including Tina Scarpelli for Secretary of State, Lorenzo ProLo Webber for Governor, Nick Chiakulas for Comptroller, Lorenzo and Kia Eabron teamed up to tackle Moot Court and Jessica Whitelaw and Jeff Brown for Majority and Minority leader. Jessica Whitelaw made MIG history by being the only first year delegate to be elected Majority leader of the house. The experience was one for the books. Triton was one of the most feared schools to partake in the simulation; The Triton MIG team wore matching hooded sweaters that made a great impact. Other MIG members from other schools continued to compliment the attire. Members also got to take a photo with Illinois Treasure Dan Rutherford. The simulation increased this year from 190 participates in the organization to 250 plus members. With more members, comes more drama. Things got hectic over the weekend, as there was a lot of miscommunication and heated debates in the senate, giving first year delegates a taste of what goes on in MIG and what can happen in government. There were tears shed, arguments to be had and still all in the end, TCD remained strong and united as they were placed third behind some of the best schools in the state. One story that was controversial was the ghost of Lincoln that appeared in a photo along with senate member Jessica Ramirez and Chief of State Kevin Ford. Special congrats goes out to Jeramie L Bizzle of the 5th Ave Journal for winning the MIG Award for Outstanding Journalist. Even with all the drama and the tough decisions that were made down their, the anticipation for next year is growing. Recently their was a TCD election, congratulations to Tina Fajairdo for retaining her title as Head Delegate and Jessica Whitelaw as she is newly appointed head delegate number two. If you are interested in seeing the TCD delegation and it it has to offer, contact Bill Decker at bdecker@triton.edu and Tom Porebski at tporebski@triton.edu.